Vacation rental condominium. Sleeps 5, 2 bedrooms, 2 bathrooms. Dogs allowed. Come on in and relax! The home is beautifully appointed with comfortable furnishings and intimate floor plan. 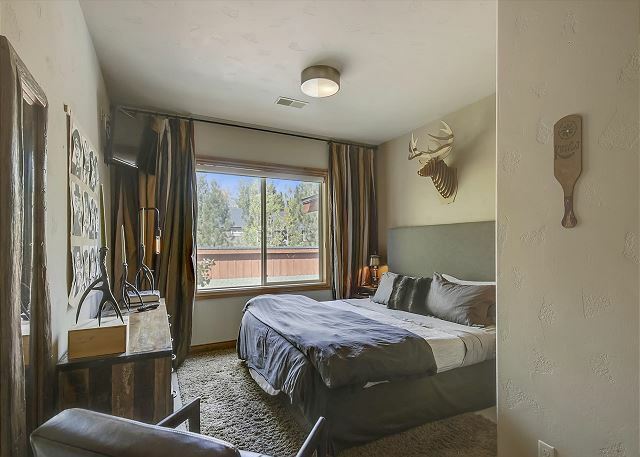 Close to downtown Truckee or just stay on the mountain and enjoy all that Tahoe Donner Resort offers! Home features a lovely master with a king and a beautiful guest room with a queen, It also has a private tv room, great for watching movies, reading a book or taking a nap.Home has a great deck to enjoy the outdoors, fresh air and the stars! Cozy gas fireplace! Our family had a wonderful stay in Tahoe Donner and will definitely be coming back. The condo was beautiful inside and out! Beautiful home, lovely ambiance, felt like we were in Vail! Home was so cozy and beautifully appointed. Perfect for our family of (4). Loved that everything was on the same level and kitchen and washer/dryer were so easy to access. Location to Donner could not be beat! Would love to request to stay again but for longer period as home was just too perfect for us. Only issue was that the fire pit propane tank was empty and Tivo wasn't working. Was excited to roast smores and watch a movie, but made do!